Does anyone of you still remember your first communion? As for me it's a bit of a blur to me to be honest. It is quite a big thing here in the Philippines, being the only Catholic nation in Asia and a country that is predominantly Christian or Catholic. All I can remember from my first communion was that everybody was excited about it. I think I was in third grade when it happened. Our school was non-sectarian but most of the time performed Catholic practices. I remember it took weeks for us students to prepare for our first communion. Our teachers allotted time for us to practice and read stuff for the event. We also did some mock communion and a dry run in the actual church where it will be held. Our parents also prepared for our first communion dresses and same things went for the boys too. We had to wear white outfits from head to toe. And when the event occurred I remembered how hot and humid it was inside the church and the whole thing went for hours. Everyone should look uniform and I think all the participant's parents bought our communion dresses from one seller which was the school's recommendation. We all looked so pristine and heavenly from what I can remember. Though being the impatient kid that I was, I think I wanted the whole ceremony to end as soon as possible, hahaha! Because you know, it took like forever. But anyway, for sure it was a memorable day for everyone. 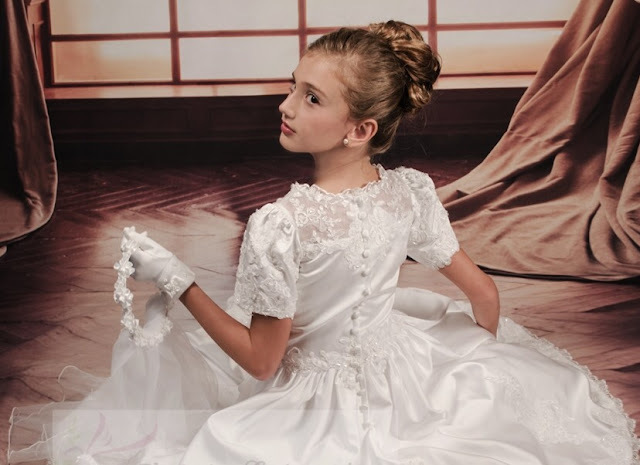 Well, just in case you know someone who will be taking their first communion anytime soon, you might want to check out the site Maria Communion. They offer a whole bunch of beautiful and fit for an angel white communiondresses. Also besides the communion outfit, the site also offers other supplies for first communion needs like head dresses, gloves, etc.